Definitely not the fairy godmother ball version but more of the cooking, cleaning, scrubbing the floors Cinderella! If you follow me on twitter (if you're not following yet, it's about time you did! jk =), you would know that I was feeling especially sick earlier in the day. Stomach acid combined with PMS stomach cramps. Eck! Spent a great deal of the morning, and afternoon, lying on the couch, watching tv and popping antacids like crazy. Still without a maid, nobody really felt like cooking so we decided to have dinner at the newly opened "Papa John's" pizza place nearby...I will dedicate an entire post for a review on Papa John's soon. Thanks for the lovely comment! love your clogs!! I like the colours... so simply but beautiful! 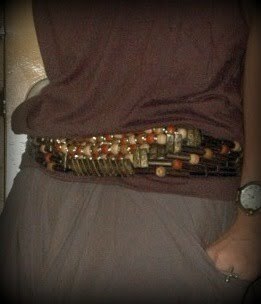 simple yet shieke love the detailing on the belt! What a splendid colour palette! Again, a splendid set of clogs! Wherever do you find them? And do you have a favorite label? For wooden shoes, my favorite label is Trippen, but they're hard to get in the States--the wood has "spring" to it.